Audioair is available as a free download. Use your headphones, wireless Bluetooth earpieces, smartphones speakers, or rally around a standalone tabletop speaker so all fans at the table or booth can hear. Within the Audioair platform, digital advertising can be offered to help convert app users to new customers for advertisers. Audioair enables an opportunity to engage with fans through their mobile device with engagement opportunities such as fantasy sports, special offers and coupons. Perhaps you love watching college basketball and the sports bar or facility showing your favorite university play along with the other 8 different games on the multiple HD televisions, displays and monitors, has only one game blasting from the speaker system and its the local conference game of the week on ESPN, but you really want to hear the game between state rivals on Fox Sports 1. In come AMG and Audioair for your digital device audio service. The company is headquartered in Durango, Colorado at the foot of the majestic San Juan Mountains with offices in the Silicon Valley and Utah. Founded in 2010, their start-up is focused on emerging technology product development. Airborne Media Group consists of a seasoned management team with an extensive track record in wireless communications and network technologies. A team of strategic partners in software development, engineering, manufacturing and market channel distribution has been assembled to provide a strong foundation for the development skills and agility required by the high-technology entertainment marketplace. 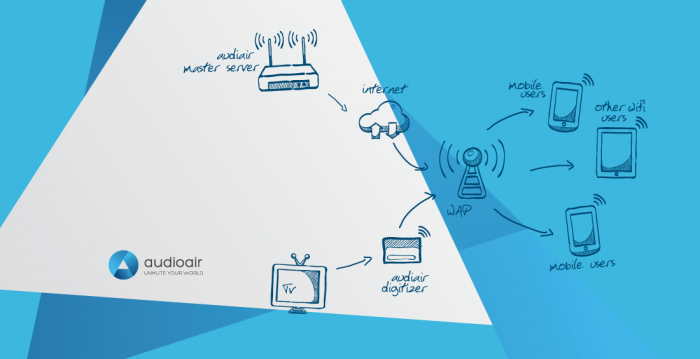 Airborne Media Group is the creator of Audioair®, a ground breaking technology that permits the users of mobile devices to selectively listen to digital screens which are muted for noise considerations and establishes a highly interactive mobile communications platform. Launched in September 2011, AudioAir delivers an entirely new entertainment experience to the sports bar, restaurant and gaming industries, as well as other public environments that are required to mute television displays. Airborne has test piloted its products and services in eight states and fourteen different metropolitan areas in such markets as sports bars and restaurants, casinos, health clubs, and college campuses. It plans to expand its product offerings to stadium complexes, shopping malls and airports as well as other locations worldwide. Your upfront costs for their system range from $1,000 for smaller establishments to five figures for the largest casinos. The two Sports Techie founders worked in sports bar and one-day it dawned upon them that patrons and fans wanted to listen to the TVs that they have going, but the establishments were keeping the sound off to keep the noise level down. They received startup advisor advice to build a platform that has community and engagement components. The founders then spent a year and a half researching their sports tech idea, attending trade shows and collecting Big Data. The founders used their intellectual property and sweat equity to attract initial seed investors and now own seven patent pending rights. The target markets for Audioair are the over 38,000 sports bars in the U.S. alone, 29,000 health and fitness clubs, 900 casinos including 435 Native American owned casinos, and thousands of hotel lobbies, hospitals, stadiums, shopping malls, arts centers and university campuses. They have had early adopters in the pilot programs like Rock Bottom Brewery, Hilton and Casinos. Talks are ongoing with Planet Fitness who is interested in AudioAir inside their 700 fitness venues. They also have private label options for the right situations. Their distribution channels are mostly regional businesses. Licensing Fees Paid by Customer Venues for Audioair: Subscription fees are determined by the size of the venue and number of televisions displays deployed therein. Typical revenue for a sports bar and restaurant is $250 per month forecast to double by 2015. Fees for Add-On Interactive Games and Features: Additional monthly fees are charged for unique features such as sports games, trivia, and other contests—a natural evolution of the product suite. Advertising Revenue: Revenue from local, regional and national advertisers on the Audioair Network is projected to outpace licensing revenue as the advertising platform is rolled-out. Customized Designs and Channel Development: Revenue from design and development of customized skins, content, and an entire “Audioair Network Platform” for larger customers is projected. Certain tribes in the United States who own casinos are raking in profits. AMG has partnered with the Southern Ute Indian Tribe, one of America’s most economically successful Indian Nations, to take a gaming enhanced version of Audioair to the casino vertical market. No tribe does it better than the Ute who have a diversified business portfolio that is in the $4 billion range thanks to a combination of oil and gas plus other profitable assets such as their casino and land. The tribe is now exploring the concept of a new data center. They have a strategic and technical alliance with AMG and together have formed a separate LLC that will build out a subsidiary product. This partner has demonstrated the vision and has the resources to drive product development for the gaming version of Audioair. The sportsbiz plan is to interact with mobile gambling. They are keeping their virtual eye on the online gambling initiatives in New Jersey and Massachusetts as well as Nevada should traction continue to accelerate as more and more states are looking at this as a potential source of state revenue, much like how marijuana is now taxed in Colorado and soon here in Washington State. The A-round of $8-$10 million slated for 2014 will be used to rapidly scale the company to over 2,000 locations generating an anticipated $2 million per month in recurring revenue by mid- 2015. The company has a implementation plan that projects over $100 million in cumulative revenue in 2016. I asked Doug and Chip how they expect to bring in $100 million by 2016. They said, “There are B2B and B2C streams that we expect to mature and generate consistent cash flow.” Their subscription model is modeled after the NFL Sunday Package by DirecTV. By adding the advertising component to the second screen environment they are offering to venues, they project substantial revenue to occur as their user adoption rate soars. They told me they made $70,000 last year. Most of the business for 2013 came online during the third quarter so revenues will show marked increases in 2014. The management team used the pilot program as a give-away for the product and collected no install fees in exchange for users to be their testers. Sports Techie, They hail from Denver Broncos land who are the 2014 NFL AFC Champions and will be playing in Super Bowl XLVIII at MetLife Stadium in New Jersey against the winner of the Seattle Seahawks vs. San Francisco 49ers NFC Conference Final game. I teased them that this is the Hawks year, not Peyton Manning. The Secret Sauce for AMG is no ad venue has been established yet. Once a customer and user base number threshold is achieved, targeted marketing will become available. The next gen app will be more cloud friendly. Their exit strategy is a buyout but only after they have executed their thorough business plan. If you are in a Sports Bar watching the NFL Playoffs on Fox Sports or CBS Sports and cannot hear the Penn State vs. Michigan State women’s college basketball game on ESPN2, ask the owners for Audioair.